Liebherr-MCCtec Rostock GmbH has presented the latest innovation for the offshore crane market at the ONS exhibition- the RL-K 2600. The ram luffing knuckle boom crane series has been extended by this model which is especially characterized by a very compact design. saving knuckle boom design without machinery house. 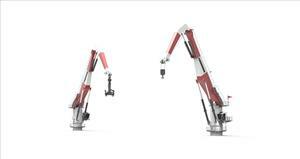 Optionally the crane can be equipped with a new developed path control, an assistant system for optimization of crane movements. The feature considers further safety aspects and thereby supports the crane driver when operating within restricted areas. The RL-K 2600 is Liebherr's is a further innovation in the offshore crane sector in 2018. In May of this year Liebherr already relaunched the compact board offshore crane series with the designation CBO. Equipped with a main hoist capacity of 100 tonnes, the CBO is appropriate for general purpose applications in the oil and gas industry. Its main unique selling proposition is also the very compact design. The tail swing radius of the CBO is less than 4 meters. The addition of the cranes to the company's portfolio underlines Liebherr's strategy to implement customer requirements and to focus on future markets.